Read this page to learn more about when to sign up for Medicare, including the different Medicare enrollment periods, from when you’re first eligible to how to sign up. You have ALS (Amyotrophic Lateral Sclerosis), also known as Lou Gehrig’s disease. You’re younger than age 65 and have a disability. *If you live in Puerto Rico and receive Social Security or RRB benefits, you will only be automatically enrolled in Part A. You will need to enroll in Part B manually. You will get a “Welcome to Medicare” packet with your card 90 days before turning 65, if you are automatically enrolled. You will not have to pay a premium for Part A. Otherwise, you may first enroll during your 7-month Initial Enrollment Period (IEP). Your IEP begins three months prior to your 65th birthday, includes your birthday month, and ends three months after your birthday. If you choose not to enroll in Part B during your IEP, you’ll pay a penalty to enroll later. This penalty may cause your monthly premium for Part B to go up 10% for each year that you could have had Part B but didn’t sign up for it. If you do not sign up for Part A and/or Part B during your IEP, you can enroll during the General Enrollment Period (GEP). The GEP runs January 1 to March 31 each year. Your premiums for both Part A and Part B may be higher due to late enrollment. If you or your spouse no longer has insurance from your employer, or if you were volunteering in a foreign country, you are also eligible to enroll during an SEP. This SEP is an eight-month period that begins the month after the employment has ended or the month after the group health plan insurance ends. You have existing coverage that is offered through an employer, you decide you do not need Part B, and you are not required to have Part B from your employer. You’ve delayed enrolling in Part B and now wish to enroll when you retire. Social Security will then send you two forms and designate an eight-month Special Enrollment Period, that will allow you to enroll in Part B without incurring a penalty. Advantage Plans, or Part C, are private plans approved by the government that combine the benefits of Part A and Part B. These plans may also provide additional coverage, including Part D prescription drug coverage. Once you are enrolled in Part A and Part B you can sign up for an Advantage plan during the Initial Coverage Election Period, which is typically the same period as your IEP. Part D, prescription drug coverage, if offered to all Medicare beneficiaries. We recommend getting Part D during your IEP, so you can avoid a late enrollment penalty, which you will likely have to pay unless you have creditable prescription drug coverage through your employer or union. To sign up for Part C, contact a health insurance company directly. Remember that each plan is different so make sure to compare plans to find one that may be right for you. Our Suggest-A-Plan tool can help you decide which type of plan may meet your needs. You can make changes to your coverage during the Open Enrollment Period, which occurs October 15 through December 7 each year. Not sure if you can apply for Medicare? 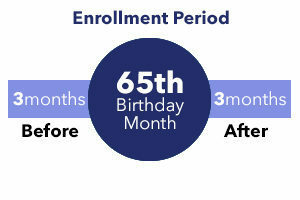 In general, you are eligible for coverage on the first day of the month in which you turn 65. However, if your birthday is on the first of the month (for example, March 1), you are eligible on the first day of the prior month (for example, February 1). You may be eligible sooner if you receive Social Security Disability Income (SSDI) or you have ESRD. You are getting Social Security retirement benefits or benefits from the Railroad Retirement Board. You are eligible for Social Security or Railroad benefits but you have not yet received them. Either you or your spouse had Medicare-covered government employment. If you are not eligible for premium-free Part A, you may still purchase Part A. To find out your eligibility and expected premium, use the Medicare.gov Eligibility Calculator.